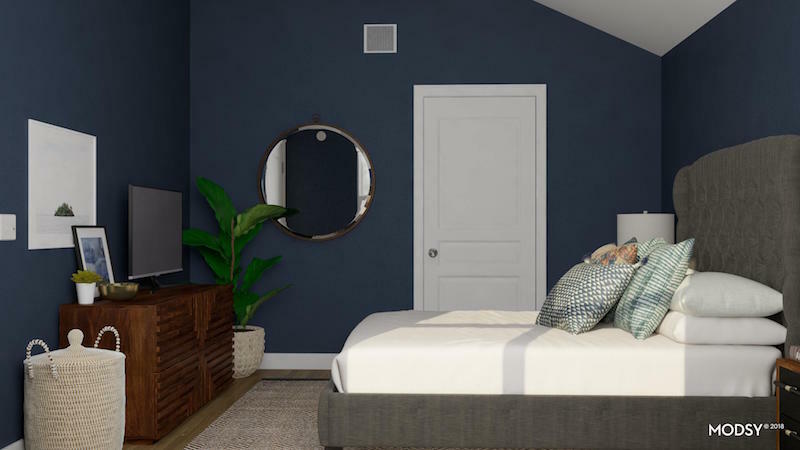 We recently had the opportunity to try Modsy to get some design ideas for our master bedroom! Here’s my full Modsy review, and a look at what we’re thinking we’ll change in there – PLUS, a bonus dicount code! This post is sponsored by Modsy, but all opinions are 100% mine. You know how there’s always that one room in your house (okay, sometimes it’s two or three!) that’s just about impossible to design? That’s our master bedroom. We have ideas about what we’d like to do with it in theory, and we have an okay start on it…but we’re a bit stuck. For the last few months, I’ve been trying to figure out what our next steps with this space will be but I haven’t really been making a ton of progress. Corey and I have both felt a little stumped with this room because it’s not very large, and it currently just feels kind of cramped. We want to add more to it to turn it into more of a retreat, but we’re worried that adding anything would just make it feel even smaller than it already does. 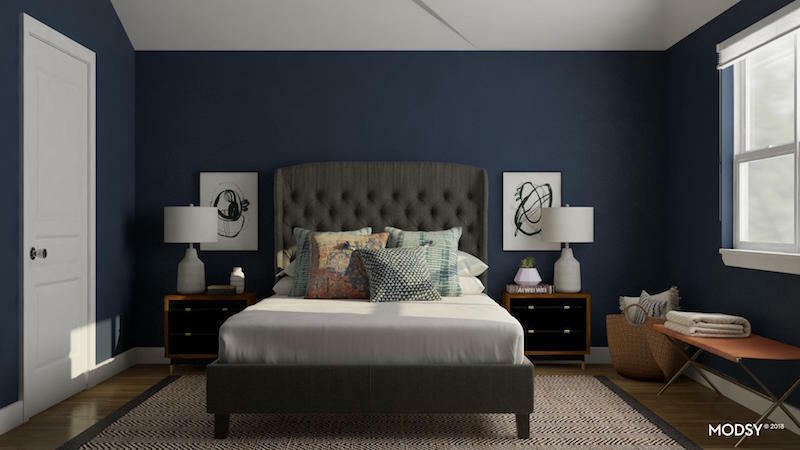 So, when I had the chance to partner with Modsy to try out their design services, I knew right away that I wanted to see what they would be able to do with our master bedroom. And, y’all, they blew my mind and I walked away from the experience feeling so incredibly inspired and actually excited to get started on our room. And, bonus I’m so pumped to be able share the designs with you today – and, want to try them out, you can use the discount code LOVEAND20 to get 20% off on your own design services! Get excited! It’s cozy and welcoming, but it feels incomplete (and, at the same time, too crowded). I know I want to make some changes in here, but I wasn’t really sure exactly what changes I wanted to make. Which is exactly why I figured using Modsy’s design services would be the perfect opportunity to get my brain working again and help me actually come up with a game plan. Find Your Style: After signing up for an account on Modsy.com, you’ll start by taking a design style quiz. This helps the designers get a better feel for the general style you like – and I found that it was extremely accurate! 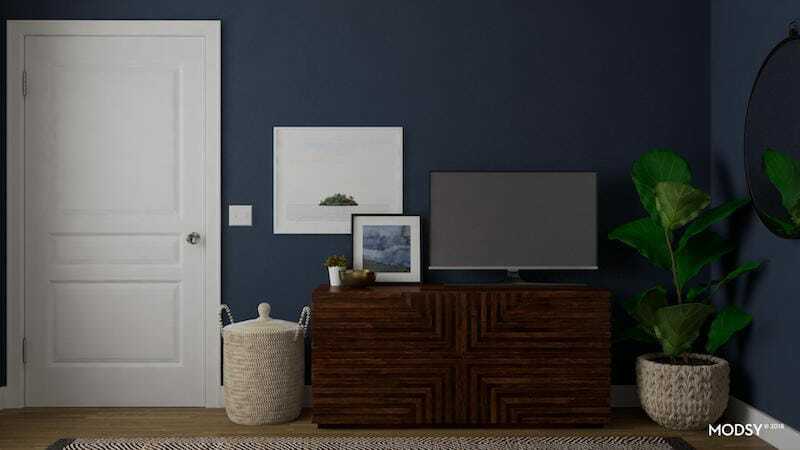 Not only did I feel like it totally nailed my style (they called my style “Rustic Warmth” – basically, a combo of rustic and transitional styles, with just a hint of mid-century modern), I always think quizzes are really fun to take! Submit Photos & Measurements: Next up, you’ll start your project. 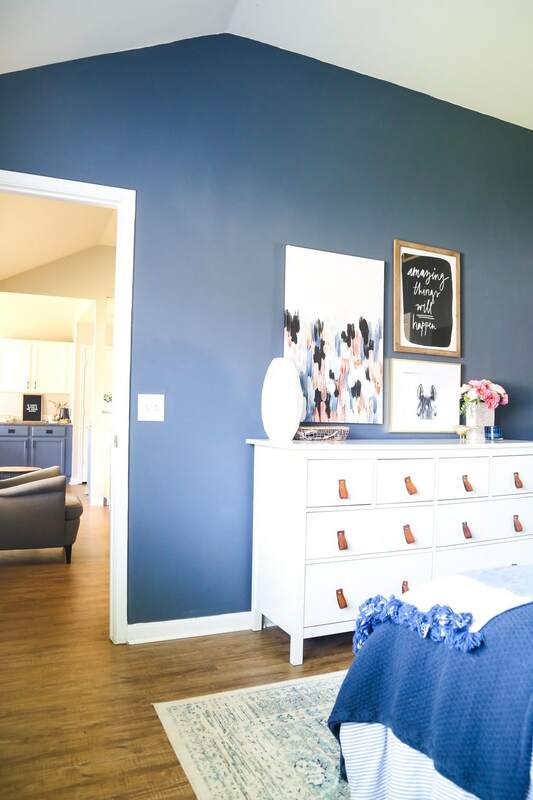 You’ll fill out information about your space (like what kind of room it is, what your budget is, and why you’re looking to redesign the room), and then you’ll submit measurements and images of your room. The best part about this is you don’t have to get fancy with your photos – you don’t even need to clean up! I wanted to keep the experience as close as possible to what a non-blogger might experience, so I didn’t even bust out my real camera for the photos – I stuck to poorly-lit, not-very-pretty iPhone photos. 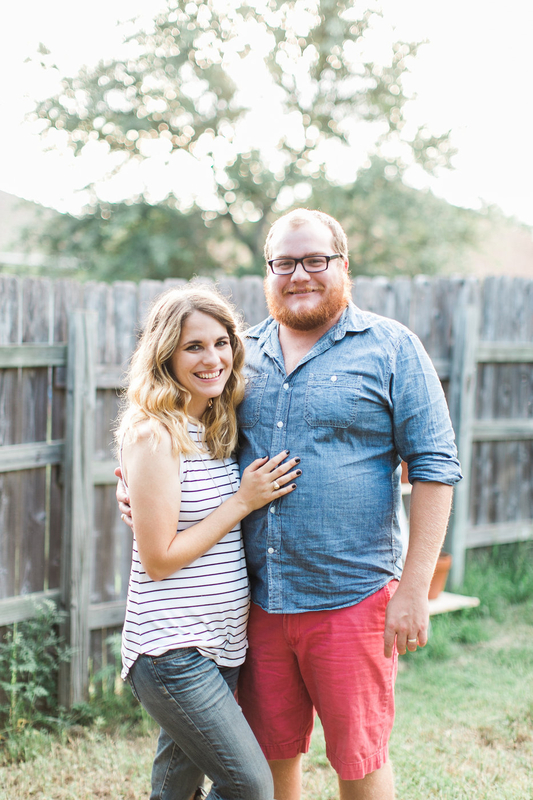 I also didn’t make the bed, move Grant’s bassinet, or clear the junk off of our dresser – these were real life photos, y’all. Share Some Details: Finally, you’ll add a bit more information about what you’re looking for in the space, like what your goals are, how you’d like to use the room, and if there’s anything in specific you want to keep in the room or that you know you want to replace. Finalize Your Design: Once everything is all submitted, all that’s left to do is wait! In 2-3 weeks you’ll get an email with two different amazing designs. And the best part? There’s unlimited tweaking allowed – if you see something you don’t like, you can just contact your designer and they’ll work with you until you’re totally satisfied with your options. Or, if you’d prefer, you can even edit things yourself using their design tool! Get to Shopping! Once you’ve got the final designs and you’re ready to get started, you can shop the exact products used in your design directly through Modsy. They’ll even provide exclusive discounts and will let you know if anything goes on sale! It really is a pretty amazing process, and I can already see myself using it again for other spaces in our house. Are you ready to see our designs? Let me remind you – this isn’t my actual room! It’s just a 3-D rendering, which kind of blows my mind because holy cow it looks realistic. The sconces by the bed immediately caught our eye and Corey and I agreed right away that we have to have them in our room. We even made a trip out to CB2 a couple of days after we got the design to see them in person. 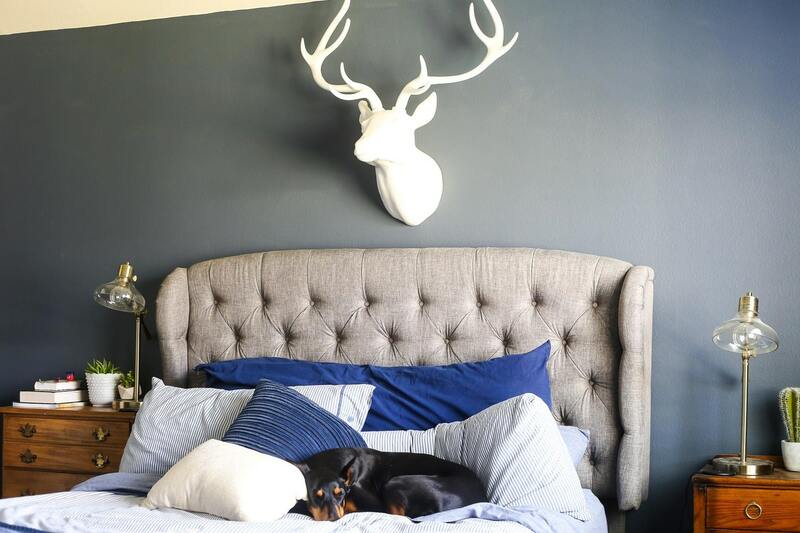 I love how large they are and the statement they make – I’ve struggled with how to fill this wall without adding to the clutter, and these are perfect for that. I also really love the shape of the nightstands. 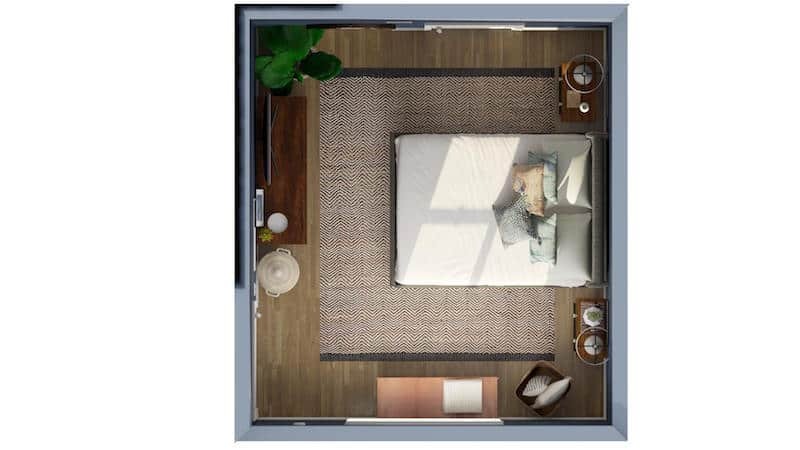 The exact ones pictured are a bit pricey for us, but I’ve struggled to find a nightstand I really like and these strike the perfect balance between lots of storage and not feeling too heavy. I love having a floor length mirror in our room but I feel like ours is a bit too large and clunky. I love the sleeker look of the one they included in the design, and I love the touch of natural wood at the top and bottom. 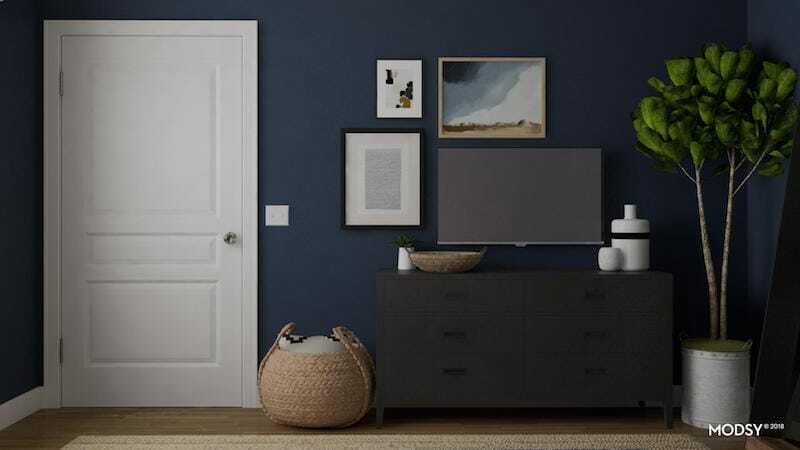 Finally, I’m a huge fan of the asymmetrical gallery wall around the television. We recently added a TV to our room and one of my requirements was that I needed to keep it in the room (because we love it dearly). I like how it blends right into the gallery wall and feels intentional. The two designs are very similar, but there are a few key differences between the two. Just like with the other design, there are a few things I really love in this particular design – and we’ll definitely be incorporating them into our room. That dresser is everything. I already talked about this on my Instastories a bit, but we’re thinking about trying to create a knock-off version of that dresser ourselves (because it’s way out of our budget). It might not look simple, but it’s actually a pretty basic shape that shouldn’t be terribly difficult to re-create. Stay tuned for this one because planning is in the very beginning stages! I love the plant in the corner in both this design and the other one. 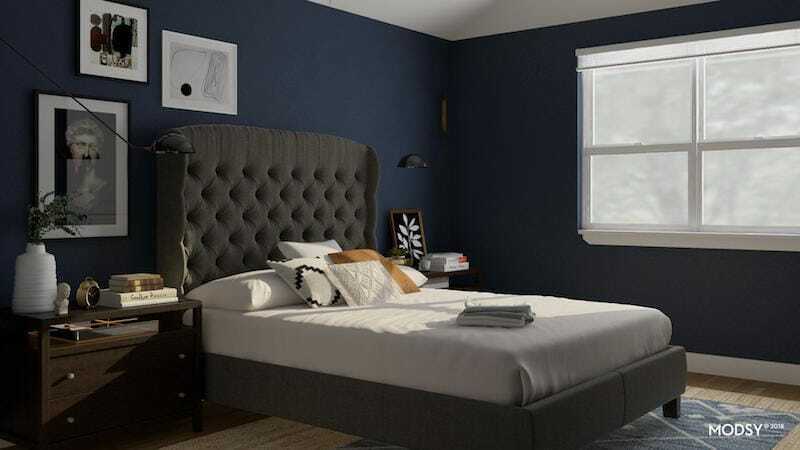 We have a faux fiddle leaf in our living room right now and it really doesn’t have a great spot to be, so I may try it out in our room instead (although, I really love the tall tree in the first design). The bench! Corey and I have actually really wanted a bench in our room since we moved in, but we didn’t think there was any way there was room for one. Looking at the design, though, it should fit perfectly! This is probably my favorite thing about what Modsy does – I never would have been brave enough to just buy a bench to put in the room without knowing if it would work, but now that I’ve seen it in the design I know the right bench would be amazing. The one used here is absolutely gorgeous – I love the leather and the nice, slim profile. I love the rug! Both Corey and I have been a bit disenchanted with the rug in our room for quite some time now, and this one is just about perfect. I’ve seen similar options at Target that are a bit more affordable, so I’m definitely going to be on the lookout for that. 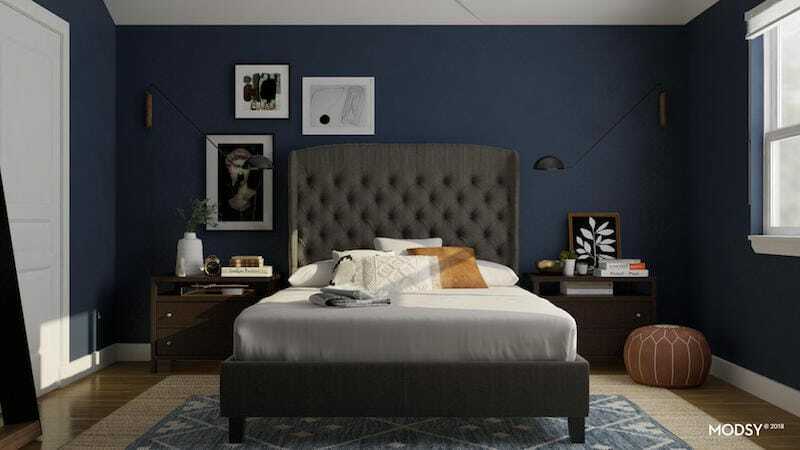 I feel so inspired to dive in and start working on our bedroom after seeing these designs. 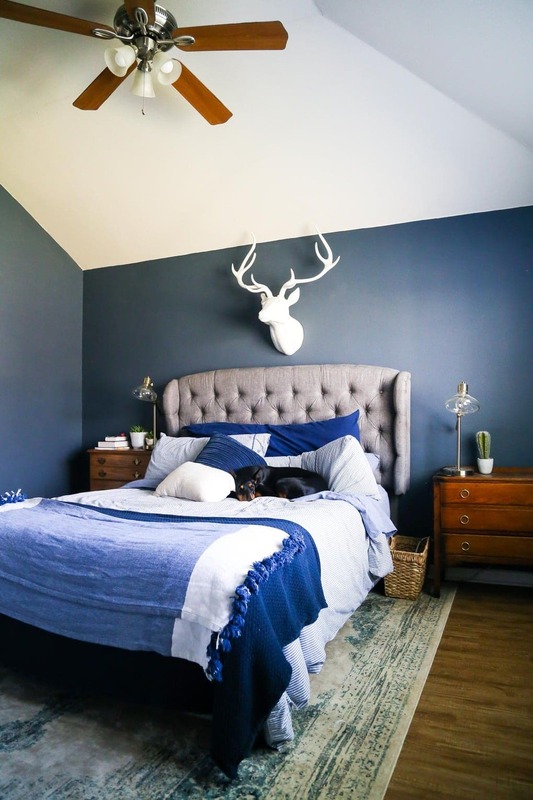 It was so incredibly helpful to see a fresh take on our bedroom and get some ideas for how to make it feel a little more “us”. I still have a lot to figure out when it comes to this room (and we aren’t ready to start changing stuff immediately since diapers are a higher priority in the budget than new lamps are), but I finally feel my creative juices flowing again and that feels good. I’d love to hear what you think! 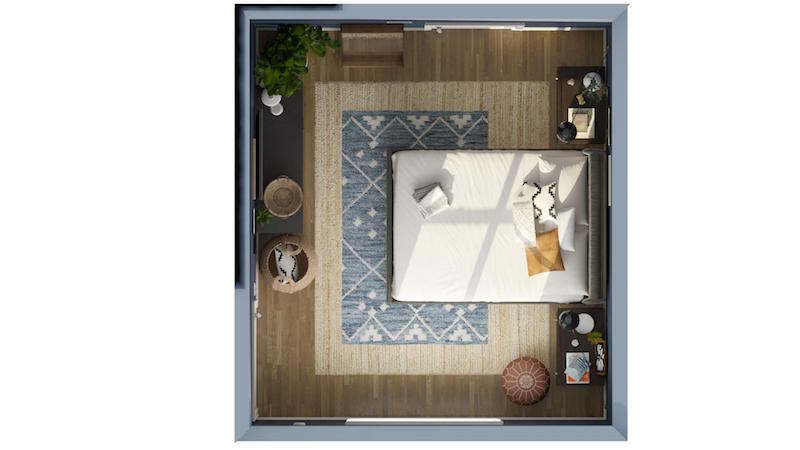 What elements from each design should I incorporate into our room? 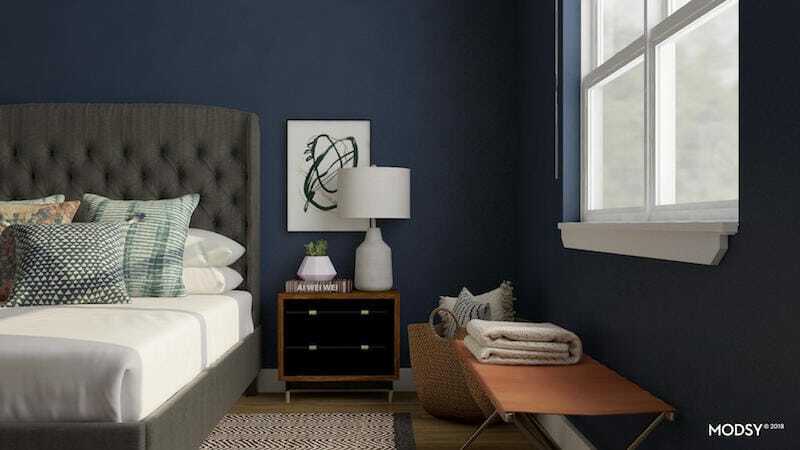 Any suggestions for amazing nightstands like the ones in design #1?! If you’ve got a room you’re feeling stuck on, I highly (HIGHLY) encourage you to check out Modsy. It’s incredibly affordable (only $59 per room!) and such a genius way to get some ideas for a space you need help with. If you decide to try it, use the code LOVEAND20 to get 20% off any design package! I kind of want to do every room in the house just for fun! Have you ever tried Modsy before? What room would you do if you were trying it?